Many people are turning to krill oil as a dietary supplement to boost omega 3 levels, but how is krill oil different from fish oil in terms of their health benefits? 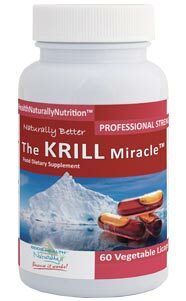 Krill oil comes from a small crustacean living in Antarctic waters. But is the krill population sustainable? This article looks at this question. Are there any known side effects of fish oil or krill oil? This article looks at the research. Most people would agree that saturated fats are unhealthy and lead to heart disease, because that is what doctors and governments have told us for decades. So why are heart disease and other chronic illnesses reaching epidemic proportions? Have doctors got it wrong? Have we inadvertently been eating an unhealthy, dangerous diet all this time? Read on to find out. When taking fish oil supplements, you might like to consider taking vitamin E as well. Packed with omega-3, fish oil is a supplement that offers you many health benefits. This article looks at the those benefits to your health. Astaxanthin is a powerful antioxidant, over 500 times more potent than vitamin C. It gives some vegetables their red colouring, and krill oil that deep red colour. Omega-3 fatty acids are extremely important to your health, and required by every cell in your body. This article discusses what happens when your body is deficient in Omega-3. We all want our cats to be healthy, and fish is good for cats isn’t it? So what about fish oil? Should we be supplementing their diet?